Blog post at Cornell Horticulture. Time lapse I pulled together this week from pix of our Art of Horticulture class building a sod sofa outside Roberts Hall on the Cornell University Ag Quad on Tuesday. Read more about it. Sod sofa in 100 seconds from Cornell Horticulture on Vimeo. 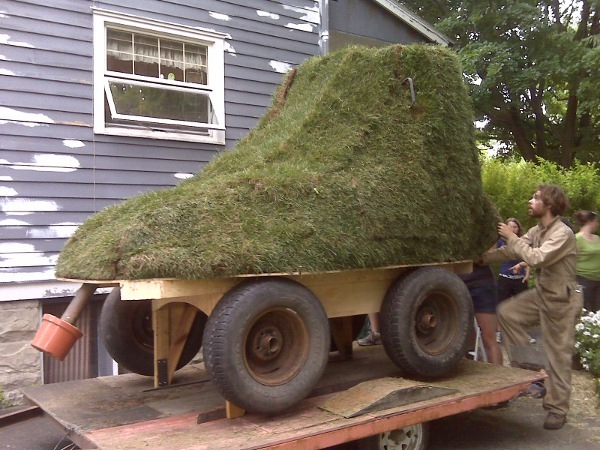 That’s the message of an article, Rx for landscape woes: Water trees and shrubs, not lawn, I posted today on the Cornell Horticulture blog. Almost goes without saying, but here in areas of the Northeast that are suffering through record heat and in some cases less than half of normal precipitation (and much of that in big storms that mostly runoff), you can let the lawn go dormant and it will usually bounce back. But for trees and shrubs — especially those that are just getting established — this can be a life-threatening situation. 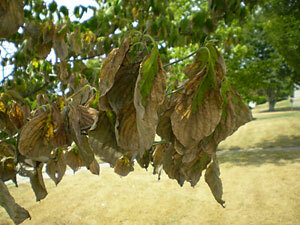 Even if woody plants have shed their leaves, you can water them now and they may refoliate. After two weeks, they’ve made up for the extra effort of putting out another set of leaves and are storing up energy for winter or future growth. It’s their float for the Ithaca Festival parade — a work in progress here, but Addy promised to hook me up with more pix later. Photo gallery of construction from the Ithaca Journal. Update [9/29/09]: Cornell Chronicle article. Cross posted from Cornell Horticulture blog. I used the same time-lapse technique that I used in this post. Sod sofa in 60 seconds from Cornell Horticulture on Vimeo. Marcia Eames-Sheavlyâ€™s Art of Horticulture class â€” with the assistance of turf specialist Frank Rossi and Cornell Plantations staff â€” spent the afternoon of September 8 creating a sod sofa in the pond area of the F.R. Newman Arboretum. 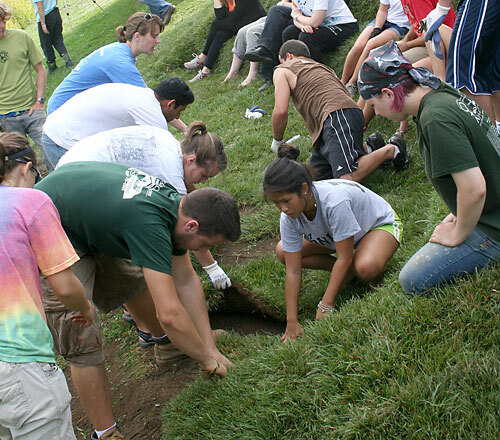 Students raked and shoveled to shape the sofa in a slope near the pondâ€™s edge. Then under Frankâ€™s tutelage put the sod in place. In 2007 and 2008, the class built sod sculptures at Bluegrass Lane Turf and Landscape Research Facility adjacent to the Robert Trent Jones Golf Course.